Seifer’s life is about to become a royal pain. . . . As captain of the local skullball team, Seifer Tombchewer is the envy of his peers. He’s fast, he’s strong, and he flies circles around the competition. But Seifer’s always dreamed of more–of leaving his tiny, remote village for a new life beyond the mountains. He just never dreamed it would happen like this. Knocked unconscious and abducted, Seifer awakens in the royal palace to learn that Prince Talon Pandemonium has gone missing. And since Seifer is a ringer for Talon, it’s his duty to replace the missing royal in his roles of diplomat, warrior, and Lord Defender of the Realm. He might fool Talon’s sisters. He might fool Talon’s army. But Seifer has little hope of fooling Talon’s enemies. . . .
Chris Wooding and debut artist Cassandra Diaz team for a classic tale of mistaken identity set against the breathtakingly original backdrop of the Darkling Realm. Once upon a time, back in God knows when (although I reckon it was about six years ago, give or take), I went to the States to the ALA conference to promote Poison. While I was there, I got talking to some guys in the US branch of Scholastic who were launching a new graphic novel imprint. They asked me if I wanted to do something for them, so I did. Anyway, finally, finally, Scholastic find an uber talented young lady named Cassandra Diaz, who was for some reason willing to commit a year of her life to drawing the little project that I began, and lo! It is here! 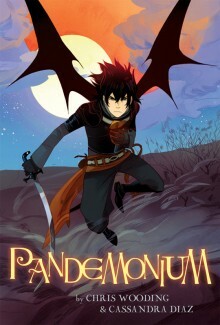 Pandemonium is a fun little spin on The Prince and the Pauper, with my own little dark twist, natch. It’s goofy slapstick in fantasyland. It’s very pretty. It will make you happy while you eat cupcakes. What else do you need to know?